Italian tableware company Paola C. produces items in metal, ceramic, glass and wood. Their most recent project, shown at Milan, is a collection of wooden objects designed by Bijoy Jain of Studio Mumbai, and Aldo Cibic, and handmade in a workshop located in a forest south of Mumbai. Here, 50 or so Indian craftsmen work with international designers. The resulting collection for Paula C. is a beautiful marriage of traditional craftsmanship and contemporary design. 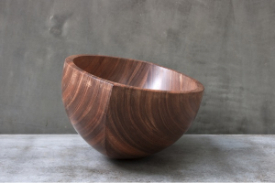 We think these bowls would look wonderful on a table teamed with our placemats and napkins! 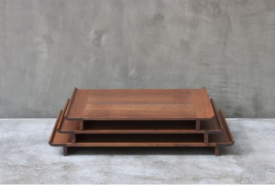 Bowl and trays by Bijoy Jain for Paola C. Produced by Indian craftsmen. Pirwi is a young Mexican furniture design company producing some really cutting edge furniture with clear environmental credentials. Using wood from sustainably managed forests, natural adhesives, and incorporating dry joints and rope-stitched seams (most appealing to the textile designer in me! ), they are committed to improving the processes of production and consumption. Some items are designed to be easily disassembled and recycled, thus encouraging the consumer to continue their sustainable efforts. Their production processes use a combination of modern precision technology and skilled handiwork which produces super-smooth hand finished wood. 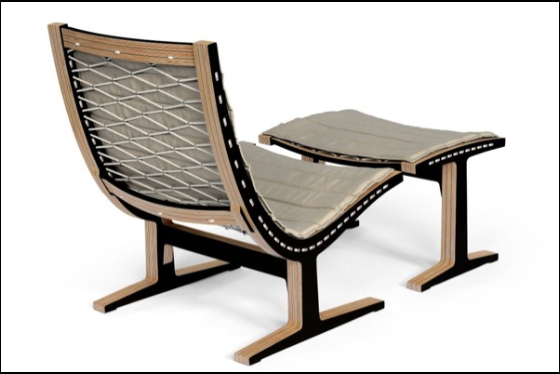 Brisee is their new lounge chair designed by Emiliano Godoy. 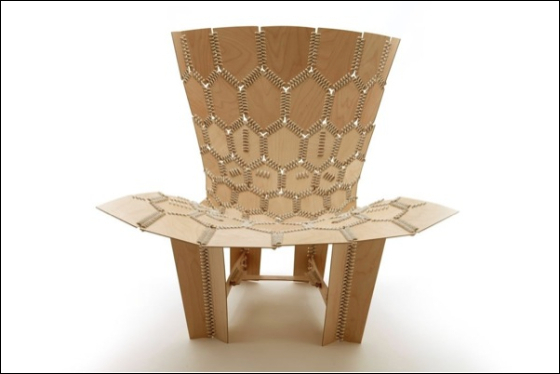 With a plywood frame, it has a cotton rope mesh seat and back supporting a thin recycled felt-filled cushion. The company's signature use of rope "stitching" was first developed in Godoy's award-winning and striking Knit chair of 2004, and elements of it also appear in the new Bloom desk, designed by Ian Ortega, exhibited for the first time in Milan. Knit (left) and Brisee chairs designed by Emiliano Godoy for Pirwi. Back to Italy, Segno Italiano is a collective of designers, artists and enthusiasts whose mission is to rediscover and rejuvinate some of Italy's dying handicrafts. They have curated a collection which includes handmade timber chairs, ceramics and hand-hammered copper cookware. All the products have a historical significance, and are indicative of a particular region's specialist handicraft skills. 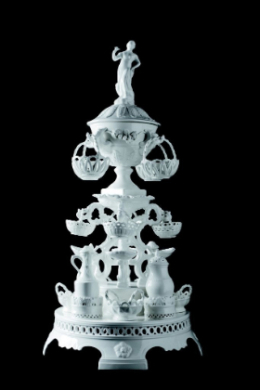 At Milan, they exhibited some amazing, and slightly bonkers, table centrepieces from Este Ceramics, designed in the 18th century by sculptor and goldsmith Girolamo Franchini. These pieces have been resurrected by Segno Italiano from antique moulds, using the handicraft skills of local artisans whose expertise has been handed down through the generations in this city near Venice. Our new collection of textiles from Nepal incorporates Aloo fibre sustainably produced from the abundant Himalayan stinging nettle. Graham's eye was caught by Green Blade, a veneer made by Fib and Co. from unwanted banana plant trunks, bought directly from the banana farmers in the French West Indies. The veneer is extremely versatile - it can be used on floors, walls and even small objects - and it's production doesn't contribute to deforestation. Editor in chief at Elle Decoration UK, Michelle O'Gundehin, tweeted from the fair that she sensed "post turmoil, natural/economic, comes reflection". I would tend to agree, and feel this contributes to the growing movement towards a more considered, human approach to design and production.